In continuation with the previous lessons this week the group worked on a couple of tasks previously set for them. This involved the group working on their example of an informal learning place in relation to ESD and searching for learning material online. As well as these tasks the group started preparing for week 9 of the course which involves the creation of an ESD video. The first task for the participants to get stuck into was that for informal learning in a learning place created by the groups. They constructed educational objectives for the learning place and how those visiting would learn in an informal atmosphere. These were then presented to the each other and this helped to show how the groups had used different methods for the task as well as creating very different learning places. 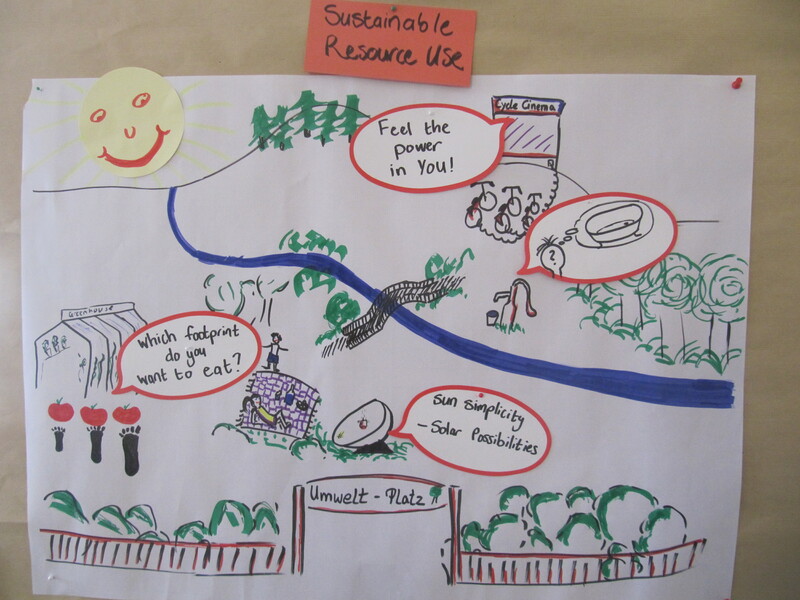 The latter included a sustainable pub, environmental park and informal learning via household recycling. The groups shown their results in the form of posters, mind maps and PowerPoint’s. Once these were sufficiently presented they received a hand out of 2 definitions of the various learning types. (formal, informal and non-formal). These were the European Union and the OECD definitions and helped to show the complexity and confusion around these different styles of learning. As yesterdays Blog entry reported, Dr Jutta Franzen had discussed with the participants the various types of online learning materials to be exploited by them. They were required then to find 2 learning materials online which reflect the issues within ESD and share this with each other through the global campus and Blogspace. The materials could be any level of teaching (formal, non-formal etc) and in any language as long as it is closely related to ESD and may benefit other members of the ESD LT team. The final task for the participants to work on today was to prepare them for week 9 of the programme which is about the training of multiplications. That week the facilitators plan for the group to create an ESD video and the last few hours of today were set aside for the participants to split up into the same thematic groups from yesterdays Blog exercise and to discuss the issues they would include in the video. The message which they had to convey in 20 minutes of work was somewhat like a trailer where they could get the main points of the movie across. These were then read out to the rest of the class and this proved to show the different tones in each one.